So? What do you think? When you stand in the middle of a vast prairie landscape do you feel like you are in a wild place? I believe that those of you that have spent time in the prairie country of Montana you would feel like it is in fact a wild place. I know for certain my great-grandmother, grandmother, and mother who grew up along Montana's Highline thought they were pretty isolated at times! But what makes a place a wilderness to you? Is it trees? Wildlife? The feeling of isolation? Lack of man-made objects? My name is Stacy Dolderer and I am lucky enough to be spending the summer with Tony exploring the Eastern half of Montana. This is a project where we are investigating the wild characteristics of the existing BLM prairie lands. My role in this project is the navigator! I get to use all the available maps and technologies to find where we are, find how to get where we want to go, and put all the data we gather together in a map to be submitted with a final report. I'll be helping Tony keep the information and images flowing about this project as the summer months progress. We just went out to our first area to get our feet wet before our official training. We learned many things...mainly that this is a big, big, big job! It's exciting, fun, humbling, and did I mention BIG? I think that if you spent some time in the wide open spaces of Montana you would be hard pressed to say that it is NOT a wild place. Every square foot of ground holds it's own ecosystem. It was certainly not the ecosystem I anticipated seeing in the Eastern part of my state. It was almost a wetland, if you can believe that! This is a hardened crossing but the water was higher than normal after a day of thunderstorms. The antelope and deer populations have been hard-hit in the last two years by snow and disease but they are there and we did see other wild creatures. There is much evidence of wild game in this area. Perhaps it's their winter range or perhaps they are use to hunters in their territory and caught wind of us before we spotted them. The evenings at camp are prime times to go for a nice hike and listen to the frogs, birds, and mosquitoes buzzing in your ears. This view stretched for miles across Montana and into Canada as well. 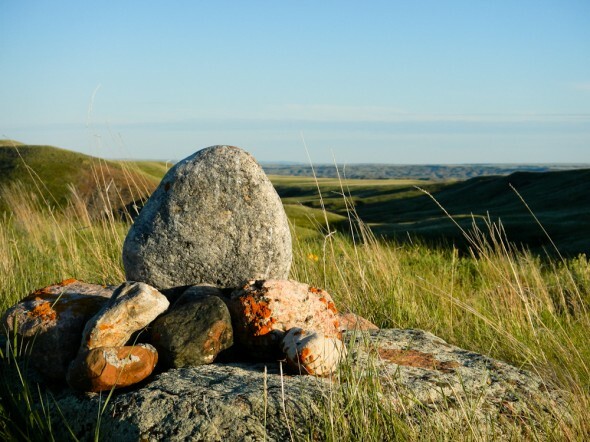 It butts up to Canada's Grasslands National Park which is now new on my "bucket list." Incredibly enough we found shell fossils on the tip tops of these peaks. They were just over 2800 feet in elevation and were the tallest spots around. Moss, lichen, wild flowers, and cactus all grow in abundance in this area. We were just shy of the prickly pear cacti blooming...it would have been a sight to see! There are also some cultural artifacts we ran across. We aren't sure of the time period or meaning of these rock piles but they were on almost every high-point we explored. It will be interesting to research the meaning of them.